It’s unfortunate that the debate around climate change, and whether it’s even “real,” has been politicized by factions from all parties (including some vocal scientists). Climate change is one of the most important issues faced by our generation. Climate change would have global impact, and affect generations yet to come. Is the climate really changing and warming? Are human activities causing climate change, or is it being caused by natural phenomena? We begin this week with the difference between weather and climate. Not much controversy here, as the difference is a matter of definition based on the statistics of weather records spanning 150 years of accumulated data. It includes direct measurements of temperature, humidity, rainfall, wind, and barometric pressure. We can go back in history even further. By drilling cores of ice from glaciers, we can “measure” past weather indirectly by comparing the contents of ice layers built up over millennia. It’s a process not unlike using growth rings from tree cores to measure rainfall over the life of the tree, but with ice cores, we can go back 750,000 years. When we examine the statistics of those records, it tells us there’s a certain amount of natural variation from year to year. That’s what we normally expect. On average, that variation averages out to zero, and individual variations are what we call weather events. When any parameter (rainfall, temperature, wind speeds, etc.) shows a long enough period of stability, we then start calling it climate. Further, if a trend in weather lasts long enough, we start calling it climate change. How long does stability, or a trend, have to last before we start talking about climate? The only way to answer that is with some math. If you really want to understand how scientists make these decisions, you’ll need to know about a statistical method called the three sigma (3σ) rule. It provides mathematical insight into data that contains random variation (as does the weather). The 3σ rule is used in scientific research, social sciences, economics, and many other areas. So it’s well worth spending some time on. That Greek symbol σ (sigma) stands for standard deviation and means just what it sounds like: how much deviation from average is considered to be standard (normal and probable) and how much deviation would be interpreted as an anomaly? Mathematically, σ measures how much the data varies (deviates) from average. For example, if you calculate σ for human adult male body mass, the average would be around 79 kg (174 pounds), and σ would be 13 kg (28 pounds). What that means is 68% of all adult males will have a mass within ± 1σ (± 13 kg) of the average, 95% will be within ± 2σ (± 26 kg) of the average, and 99.7% will be within ± 3σ (± 39 kg) of the average. By comparison, if you calculated σ for human adult male eye diameter, you’d get a much smaller variation from average. So what σ basically tells us is how much variation is normal (or probable), and how much variation constitutes an anomaly (something improbable). When scientists observe data that are more than 3σ from the average, they look at it closely to check for data errors. If the data are valid, they start looking for an explanation of why something with a probability less than 0.3% (100% – 97.7%) actually happened. If we apply the 3σ rule to weather records, we can tell if a change is normal variation or an anomaly. And what we’ve found is that there’s been a lot of anomalies over the past few decades, and a long-term warming trend since the start of the Industrial Revolution. Something is causing these events other than random chance. Over the long run, when the 3σ rule tells us something improbable is happening, there’s almost always a physical cause. So rather than reciting official scientific definitions, I’ll do this descriptively. Let’s first look at weather. Weather is a local phenomenon that typically spans an area the size of one city to a few states. 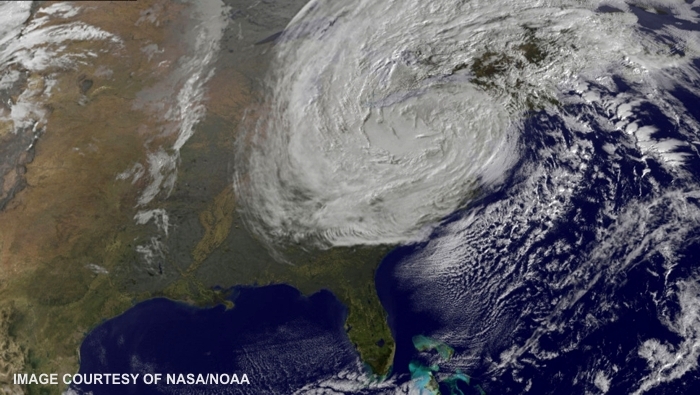 Despite the enormous size of Hurricane Sandy in 2012 (top graphic), Sandy was a weather event. The length of time a weather event persists is measured in minutes (for a hail storm) to weeks (for a hurricane). Cities, lakes, mountain ranges, and ground cover can have a significant influence on local weather. Now let’s take a look at climate. Climate is a regional to global phenomenon. The current drought in the American Southwest is one example. Changes in climate are a gradual process, occurring over time spans of decades to thousands of years. Climate change is inferred from a weather trend that persists with a 3σ deviation from average. Past causes of climate change include alterations of atmospheric chemistry, changes in Earth’s orbit or tilt, variations in solar radiation, and catastrophic events like major volcanic eruptions, asteroid impacts, and magnetic field reversals. Next week we’ll examine the second question: Is the climate really changing and warming?